To avid online shoppers, this might seem a familiar behavior. If a confirmation button is slow or unresponsive, for example, mashing on it until you’re red in the face can be a common reaction. Why is multi-click behavior important? Multi-click behavior is a telling insight into a customer’s frustrated emotional state. It’s a common behavior that digital teams should be aware of, measure, and - like with bird's nest behavior - ultimately aim to eradicate from their websites and apps. Digging into the data, our data scientists confirmed how indicative multi-clicking behavior really is of frustrated user experiences. On a major financial services website, for example, our data scientists analyzed 3 million user sessions that interacted with the site’s ‘Get a Quote’ form. We found that the average completion rate of the form was 77%. For sessions that contained a responsive multi-click behavior, however, the completion rate was just 17%. And for unresponsive multi-click behavior, the completion rate was even lower, at 14%. 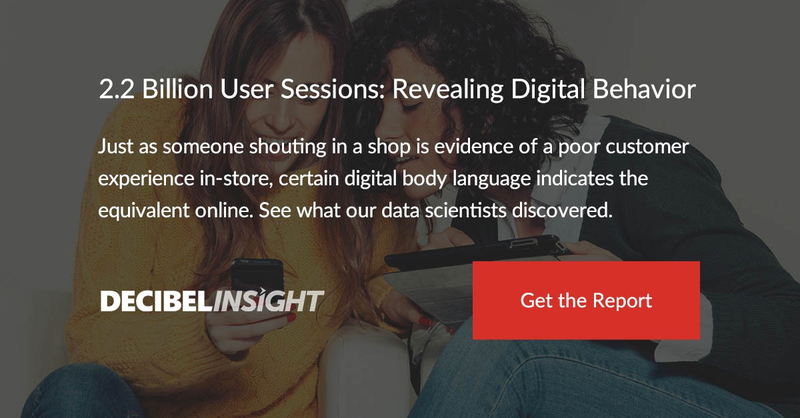 To learn more about multi-click behavior - and other digital behaviors that denote user sentiment - download our full report on digital body language below.